This observation is consistent with the unanimous resolution of West Bengal Assembly against Aadhaar. New recruit in defence and non-defence sectors, too, ought to make note of it and undertake immediate measures to protect future recruits from mandatory Aadhaar-enabled biometric attendance systems. All the 639 departments, where it was mandatory, must revise their orders to comply with the court’s order. The Supreme Court’s order on Friday with regard to not linking the unique identification number (UID)/ Aadhaar number with PAN, in Binoy Viswam vs Union of India case, has relevance only for 0.4% of the 29-crore PAN holders. But its categorical observation in para 90-91at page 105-106 of the 157-page-long verdict has special relevance for UID/ Aadhaar holders, Indian residents and foreigners (who lived in India for 182 days after September 12, 2016, and who lived in India even for one day prior to it) and even for those who are opposed to UID/ Aadhaar. This most significant part of the order has been glossed over mainstream media. Media had erred in misreporting the court’s order in Lokniti Foundation case and till date, it has not rectified its mistake by perusing the order of February 6, 2017, and in the light of the court’s written observation dated June 9, 2017. This observation merits the attention of all states, union territories and public and private agencies, including banks and railways, besides the media and their advertisers. This observation is consistent with the unanimous resolution of West Bengal Assembly against Aadhaar. New recruit in defence and non-defence sectors, too, ought to make note of it and undertake immediate measures to protect future recruits from mandatory Aadhaar-enabled biometric attendance systems. All the 639 departments, where it was mandatory, must revise their orders to comply with the court’s order. In the verdict, the bench referred to Attorney General Mukul Rohatgi’s submission wherein he referred to “various orders and judgments of this Court whereunder use of Aadhaar was endorsed, encouraged or even directed” from pages 78-80. This is factually incorrect, especially in view of the court’s observation at pages 105-106. On Feb. 6, 2017, a division bench of the Chief Justice of India and Justice NV Ramana heard the Lokniti Foundation v. Union of India, wherein it was prayed that “the Aadhaar Card or such other biometric identification may be made compulsory for verification of the mobile phone subscribers that can ensure 100% verification of mobile phone”. Pursuant to the Attorney General’s submission, the bench decided to adhere to Constitution bench’s order that keeps biometric UID/ Aadhaar number voluntary. This observation cannot in any way imply that the court approved of Aadhaar and its linking with phone connections. Manufacturing a reality of its own, the Department of Telecommunications issued a circular dated Mar. 23, 2017, making Aadhaar mandatory “regarding 100% E-KYC based re-verification of all existing subscribers” in the name of “implementation of Hon'ble Supreme Court orders”. It is evident that the Attorney General believes that the two-judge bench’s order will prevail over the five-judge Constitution Bench’s order. Now Justice Sikri’s bench has also found out that even the Aadhaar Act does not make UID/ Aadhaar mandatory. In order to comply with the court’s order dated June 9, there is a compelling legal logic for the Central government to withdraw its March 23, 2017, circular. Justice Sikri Bench observed, “A person who is holder of PAN and if his PAN is invalidated, he is bound to suffer immensely in his day to day dealings, which situation should be avoided till the Constitution Bench authoritatively determines the argument of Article 21 of the Constitution. Since we are adopting this course of action, in the interregnum, it would be permissible for the Parliament to consider as to whether there is a need to tone down the effect of the said proviso by limiting the consequences”. 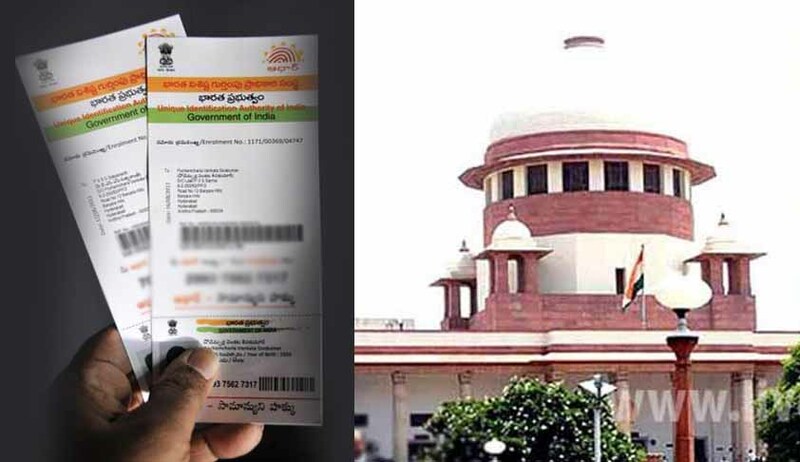 In the light of all the relevant orders of the Court, including the order of the Constitution Bench, the factual position is that the case with regard those who are not PAN holders, those who are PAN holders, those who are UID/ Aadhaar holders and those who do not intend to have UID/ Aadhaar numbers is yet to be considered on the touchstone of Article 21 of the Constitution. It has opined that till the aforesaid aspect of Article 21 is decided by the Constitution Bench, a partial stay on the Section 139AA of the Income Tax Act is necessary. It clearly emerges that the government was compelled to amend the Aadhaar Act, 2016, through the Finance Act 2017, because the Aadhaar Act does not make it mandatory for anything. The partial stay on Section 139AA of the Income Tax Act reveals the fact that governments and several agencies have been illegally coercing Indian residents to enroll for UID/ Aadhaar. Notably, Section 2(k) of the Aadhaar Act that defines "demographic information" as information relating to name, date of birth, address and other relevant information of an individual, as may be specified by regulations for the purpose of issuing an Aadhaar number, but shall not include race, religion, caste, tribe, ethnicity, language, records of entitlement, income or medical history. Section 2(n) of the Act defines "identity information", saying it includes his Aadhaar number, biometric information and demographic information. If both the Sections are read together, it means that “identity information” will not include income and records of entitlement. This implies that PAN cannot be linked to UID/Aadhaar also because it tantamounts to collecting demographic information regarding income. It also means that Aadhaar cannot be linked to entitlements of social benefits and services because that would amount to seeking records of entitlement. In any case, given the fact that entitlements are for “citizens” of India, not residents of India, UID/ Aadhaar, a proof of residentship, cannot be used to deny citizens’ entitlements. Justice Sikiri’s bench has reproduced the provisions of the Act in his verdict, but has not applied judicial mind to its implications in the hope of that Constitution Bench will do so. Legally, it is apparent that the Supreme Court’s order dated Jun. 9, 2017, by the two-judge bench is required to be complied with to the extent that it is consistent with the order of five-judge Constitution bench. As far as it is inconsistent with it, it cannot be deemed binding because of “judicial discipline” referred to in Aug. 11, 2015, order of three-judge bench of Justice Chelameswar, Justice SA Bobde and Justice C Nagappan. On Oct. 15, 2015, a five-judge Constitution Bench had reiterated the setting up of such a bench with a sense of urgency. But although almost two years have passed, the Constitution Bench’s order remains unattended by the 43rd and 44th Chief Justice of India. On Aug. 11, 2015, a three-judge bench had also requested the Chief Justice for the same. Justice Sikiri bench said, “It would be desirable that the matter be heard at the earliest” by the Constitution Bench. In the meanwhile, if the Union of India has even an iota of morality, sense of fairness and regard for truth, it should give wide publicity that it is not mandatory for a citizen to obtain an Aadhaar as per the court’s previous orders reiterated on June 9, 2017, and as per the Aadhaar Act, 2016. The deliberations recorded in the verdict by Justice Sikri’s bench underlined that Central Identities Data Repository (CIDR) of biometric UID /Aadhaar Numbers is an affront to right to democracy, national security, right to human dignity and right to privacy, fundamental issues on which only the yet-to-be-constituted Constitution Bench can adjudicate. It must be recalled that 3.57-crore signatures were submitted to the Central government demanding scrapping of Aadhaar. Instead of waiting for the Court to pronounce it final verdict, the cause of fundamental rights creates a rationale for boycott of UID/ Aadhaar and related schemes by the states and citizens.